1980s Seville. Carmen declares that any person she loves should beware. However, even she is unprepared for what will happen when she decides to seduce Don José, an army corporal who initially appears uninterested in her charms. Don José soon abandons his sweetheart Micaëla and his army job for Carmen, and joins her and her smuggler friends in the mountains. But Carmen quickly wearies of Don José's possessiveness. When she turns her attentions to the dashing toreador Escamillo, Don José's jealousy erupts into violence. 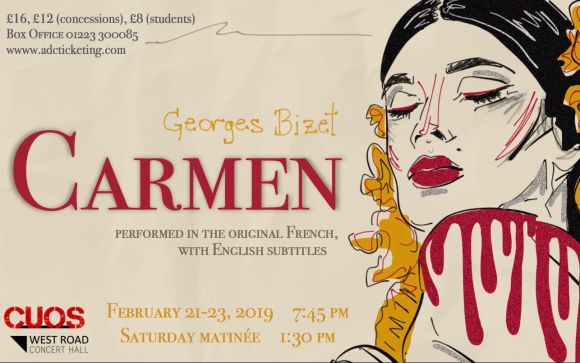 This ambitious production, directed by Eleanor Burke and performed in the original French (with English subtitles) with full orchestra under the baton of Oliver Cope, will bring together some of Cambridge University's finest musicians, singers and dancers to create a truly spectacular evening. Please note this performance will contain smoke/haze effects.